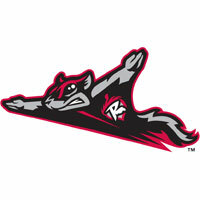 The Richmond Flying Squirrels (24-28) road woes continued as they dropped the opener of a three-game series to the Altoona Curve (23-27) on Tuesday night at Peoples Natural Gas Field. The Squirrels did jump out to an early lead with a run in the first inning off of Altoona right-hander Brandon Cumpton. Gary Brown walked to start the ballgame, but was thrown out attempting to steal second base. Ehire Adrianza got the Squirrels started again with a one-out double up the third-base line. Juan Perez followed with a single to left field, plating Adrianza for a 1-0 lead. The Curve drew even with their first run off of right-hander Justin Fitzgerald in the second. Matt Curry rifled a double into the right-center field alley to open the inning and advanced to third on a passed ball. Fitzgerald then walked Jarek Cunningham. With runners at the corners, Jeremy Farrell bounced a ball on one hop to Richmond third baseman Chris Dominguez. Dominguez came home to cut down Curry. However, Cunningham took second base on the play. He scored from there to tie the ballgame on a single through the left-side of the infield from Miles Durham. Altoona forged ahead for the first time and chased Fitzgerald from the ballgame in the fifth inning. With one out, Brock Holt singled. Tony Sanchez followed and pulled a double inside the third-base bag. The ball rolled to the left-field corner and Holt raced around for a 2-1 lead. Fitzgerald struck out Curry, but Cunningham notched a single to bring in Sanchez for a 3-1 advantage. Fitzgerald departed following the base hit for Cunningham. For the fourth time on the season, Fitzgerald failed to survive the fifth inning. He endured his third loss of the year over 4 2/3 innings, charged with three earned runs on seven hits. He walked two and struck out three. Cumpton (6-4) lasted seven innings, earning his third win of the year over Richmond and his sixth overall. He allowed just a lone run on three hits, walked three and struck out three. Right-hander Vic Black finished the ballgame on the hill for the Curve, working the last two innings. Altoona plated three runs against the Richmond bullpen, notching two against right-hander Austin Fleet and a final run against lefty Ari Ronick. Game two of the series is scheduled for Wednesday night at 6:30 at Peoples Natural Gas Field. Richmond RHP Craig Westcott (4-4, 3.86) will make the start opposite Altoona RHP Shairon Martis (3-0, 2.63). Pregame coverage will begin at 6 PM on Sports Radio 910 and SportsRadio910.com.